Debit spreads are given this name simply because, in the end, they withdraw money from your trading account - i.e. create a debit to your balance. They are called 'spreads' because you have included more than one option position in the combination. In spreads, each single position is usually called a "leg". A vertical spread, consists of an equal number of 'bought' i.e. 'long' option contracts and 'sold' i.e. 'short' option contracts - but with different strike prices. To be a debit spread, the 'sold' option contract must be further 'out-of-the-money' than the bought option contract. If not, then it would either be a straddle or a credit spread, assuming only two positions. So if you're buying a put debit spread, you would buy put options at a strike price closer to the current market price and simultaneously sell the same number of put options at a LOWER strike price than your bought positions. The 'sold' options will give you an income, or credit, which will effectively offset the cost of the 'bought' or 'long' options you have purchased. The overall effect still be a debit - hence the name 'debit spread' but your capital risk will be much lower. Vertical debit spreads involving call options are known as "bull call spreads" while those involving put options are "bear put spreads". Unlike simple long option positions where your potential reward is theoretically unlimited, vertical spreads have limited potential profit. The maximum profit is the difference between the strike prices, less the initial debit. But in return, you lower your overall risk as well as your exposure to time decay. You can also sometimes take advantage of option implied volatility (inflated option prices which work against you). Before you enter a debit spread, your policy should be to pay not more than 50 percent of the difference between strike prices. So if you're doing a $5 spread, you would not want to pay more than $2.50 for it. For a $1 spread, no more than 50 cents etc. In other words, you would like to see at least 100 percent profit potential before entering the trade. Your $2.50 should have the potential at option expiration date to return you $5 profit and so on. An example might be a company whose current share price is $20. Your stock charting analysis leads you to believe its future price direction will improve to an expected $25. So you decide to enter a 'bull call spread' by buying $20 call options and selling the same number of $22.50 call options, thus creating a $2.50 spread. If the share price moves north, your $20 call option will increase in value and the deeper 'in-the-money' it goes, the 'delta' component will also increase so that the option price will move at close to a 1:1 ratio with the share price. Meanwhile, the 'out-of-the-money' sold option price will also increase, but not at the same rate, since its delta is much lower and until it hits 'at-the-money' status, its only real value is 'time value' which is the probability it will be 'in the money' at expiry date. So the difference in option price response to movements in the underlying stock price, is where your debit spread makes an overall profit. If you let it run until expiration date and the stock price is above $22.50 you make 100 percent profit on the trade if you have paid not more than $1.25 for the spread. 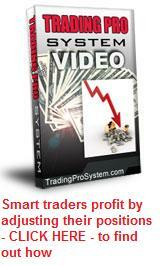 Profiting from option trading involves the important issue of money management. It's all about risk and reward - the amount of your overall capital you risk vs potential reward on each trade. The preferable result is for the underlying stock, commodity or other financial instrument, to move in your anticipated direction and you take a profit. But what if it goes against you? Debit spreads cost much less than simple long positions, so if the underlying price goes against you and you have factored in at least 100 percent potential profit on each trade, you can consider averaging up or down as a way of stacking the odds in your favor. This means that you take out another debit spread AFTER the stock price has moved significantly against you. The likelihood of a reversal is much greater and the 100 percent profit from your second trade should offset any losses on the first. Unless there is something fundamentally wrong with the company, most stock trade within a larger range over the long term. Using 'weekly' charts you can easily determine this. You can also consider buying back your original 'sold' position if you think the stock price might return to somewhere close to where you entered the debit spread. If the underlying price has initially gone against you, the OTM 'sold' option will rapidly decrease in value so you will profit on this leg of the transaction. You then add this cost to your intial debit and then wait for the 'long' option leg to increase in value. Sometimes you can make a great profit this way. Combine the strategy with 'averaging down' above and you increase your likelihood of success.